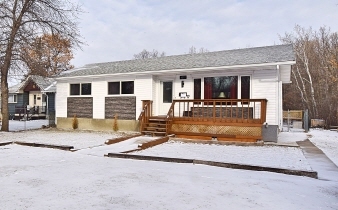 Country living in the heart of Charleswood! Rarely available, private and peaceful location. 1155 sq ft, 3 BR 2 bath bungalow home with a screened in room overlooking the amazing yard (52x157 lot).Open concept main level featuring a bright living room with a newer tri-pane window (2015).Huge eat-in kitchen with ceramic tile flooring, 4 appl, plenty of counters and cabinetry. 3 bedrooms, laundry area and a remodeled 4 piece bath (2018) complete this level. The lower level is partly finished with a wood structural floor,HRV, newer 3 pc bath (2018), HWT (2012) and tremendous potential to further develop. Absolutely stunning, fully fenced park-like yard with a deck, firepit and ABOVE GROUND POOL to enjoy the hot summer days. Maintenance free exterior and amazing curb appeal. Shingles, siding, soffits, eaves (2016), PVC windows, front door (2015).Nestled right next to the HARTE TRAIL and DEEP WITHIN THE MATURE FORESTRY THAT MAKES CHARLESWOOD FAMOUS AND SOUGHT AFTER.